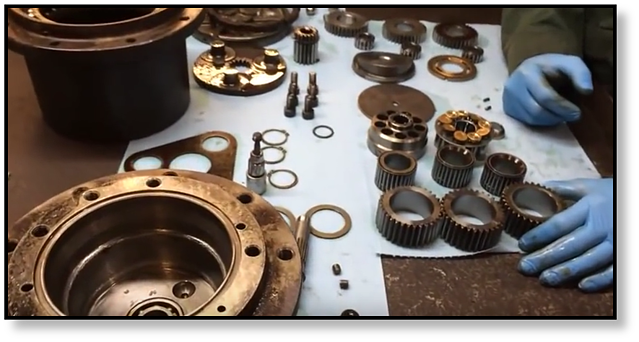 We recently had a Rexroth single speed final drive for a Caterpillar track loader come into the shop for repairs, and thought we would take that opportunity to talk about our rebuilding process for final drives and hydraulic motors. The final drives and hydraulic motors that come into our shop are not pretty. They’ve been out on the job site working hard and need to be cleaned up a bit before we can open them up. 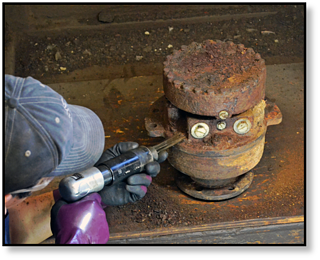 We expect that, and that is why the first step of our rebuilding process involves cleaning up the exterior of the final drive so debris and rust do not end up inside of it – our commitment to quality begins even before we open the final drive. Next, we fully disassemble the final drive – not one bolt is left unturned, so to speak. After it has been disassembled, the parts are degreased and thoroughly cleaned. Our experts then examine every part that comes out of the final drive and it is assigned either a pass or a fail. If it fails our inspection, then we replace it with a new part. 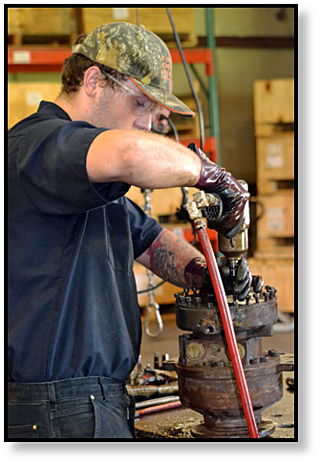 We have highly trained staff that are able to locate the most difficult to find parts. Our technicians also have access to all the equipment they need to restore, resurface, lap, bore, and recertify the components that passed inspection. All bearings and seals are automatically replaced with new ones, because we cannot be comfortable with the level of quality unless we know these key parts are brand new. Once the replacement parts have been pulled from inventory and the remaining parts have been recertified, another one of our technicians reassembles the final drive. Once the drive has been reassembled, it goes through two phases of testing. First, it needs to pass leak checks to test the integrity of the drive. The second test involves hydraulic performance checks before we feel it is ready to send out to you. This performance testing includes idle test, load test, case drain flow, brake engage and release pressure, RPM performance, and, if applicable, dual speed performance. Once those tests have been completed and the results logged into our system for traceability, the final drive is painted. Then it is ready to be packed and shipped to the customer. Our technicians take great pride in their work and all share a strong commitment to quality while at the same time minimizing your downtime. Quality begins from the moment a drive arrives in our shop and continues until it leaves. When it comes time to replace a final drive, don't forget that you have options beyond new OEM and aftermarket final drives. At Texas Final Drive we receive a catastrophically damaged final drive motors, the source of the problem often turns about to be related to the case drain line. In this free eBook, Final Drive Motor Case Drain Disasters, we are going to discuss the types of damage that can occur when something goes wrong with the case drain line, how that damage occurs, and how it can be prevented.